Thursday’s ride took me out Esplanade in the new-to-me bike lane that took the place of a second lane of car traffic. I’m sure there were some angry drivers, but for me it was magical. This used to be such a rocky ride, but on this day I just flew, and it was perfect. Then I was in City Park and letting my body memory take me to the Wisner bike path along the bayou, past the weird bayou-front apartment complexes and the Fairgrounds and the intersectiond where I used to take a right to see what was over there. 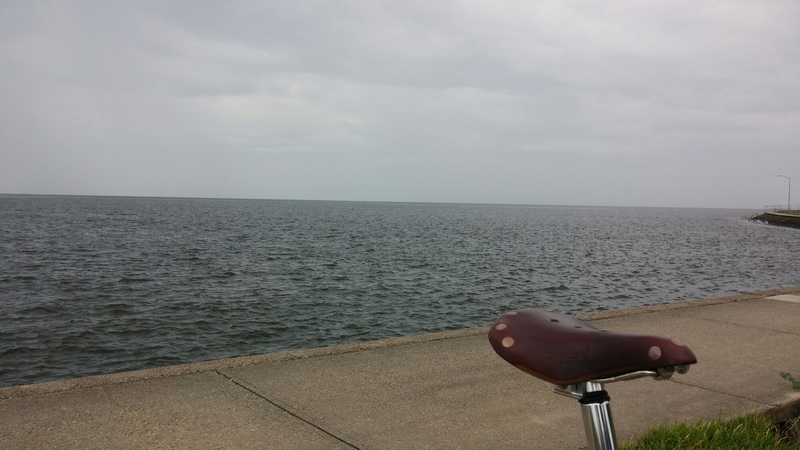 I took it to the end, out in the street up to Lakeshore Drive–the old piano’s gone–and along the blustery water. It’s still quiet up here, almost always quiet, and I had that sense that wrapped so much of my time in this city: I am totally alone, just me and my bike and this beautiful place. Rattling around in an empty cage, I used to say, kind of my favorite way to be. And then I took another way home and remembered the baby raccoon I saw over here once. I knew there was nothing I could do, but I wished there was something I could do for that sad little guy. I took a quick way back to Treme to meet S., J., and R. for a ride out to Wallace for a trip to the Whitney Plantation and a reminder that this isn’t an empty cage at all– it’s haunted, all the cages past and present.